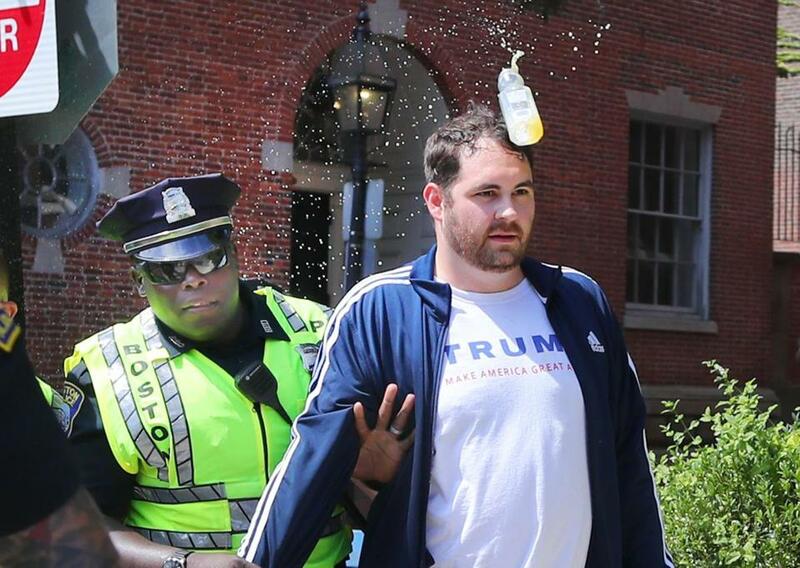 A police officer escorted a participant in Saturday’s “free speech” rally away from the scene as a water bottle was headed in his direction. That was the day in a nutshell. 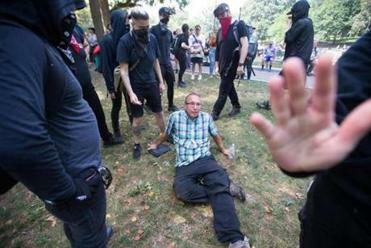 Participants in the “Boston Free Speech Rally” had been demonized as a troupe of neo-Nazis prepared to reprise the horror that had erupted in Charlottesville. They turned out to be a couple dozen courteous people linked by little more than a commitment to — surprise! — free speech. But he and the others who gathered at the Parkman Bandstand had never stood a chance of competing with the rumor that neo-Nazis were coming to Boston. That toxic claim was irresponsibly fueled by Mayor Marty Walsh, who denounced the planned rally — “Boston does not want you here” — even though organizers were at pains to stress that they had no connection to Charlottesville’s racial agenda and intended to focus on the importance of free speech. What happened on Saturday was both impressive and distressing. A massive counterprotest, 40,000 strong, showed up to denounce a nonexistent cohort of racists. Boston deployed hundreds of police officers, who did an admirable job of maintaining order. Some of the counterprotesters screamed, cursed, or acted like thugs — at one point the Boston Police Department warned protesters “to refrain from throwing urine, bottles, and other harmful projectiles” — but most behaved appropriately. Though a few dozen punks were arrested, nobody was seriously hurt. But free speech took a beating. The speakers on the Common bandstand were kept from being heard. They were blocked off with a 225-foot buffer zone, segregated beyond earshot. Police barred anyone from approaching to hear what the rally speakers had to say. Reporters were excluded, too. All they were guilty of was attempting to defend the importance of free speech. For that, they were unjustly smeared as Nazis and their own freedom of speech was mauled. Boston was kept safe on Saturday. For that, city authorities deserve great credit and thanks. But in the course of preventing a riot, those authorities rode roughshod over the free-speech rights of a small, disfavored minority. That is never a good thing, whatever the police commissioner may think. This column is adapted from the current issue of Arguable, Jeff Jacoby’s weekly email newsletter. To subscribe to Arguable, click here. Jeff Jacoby can reached at jacoby@globe.com.